Menopause symptoms can be frustrating and uncomfortable, affecting every woman differently. During menopause, a woman's hormone levels (specifically estrogen) fluctuate and then drastically decline. This causes a number of symptoms, including hot flashes, weight gain, mood swings, vaginal dryness, and fatigue. Exercising offers countless health benefits, but sometimes, it can seem daunting. 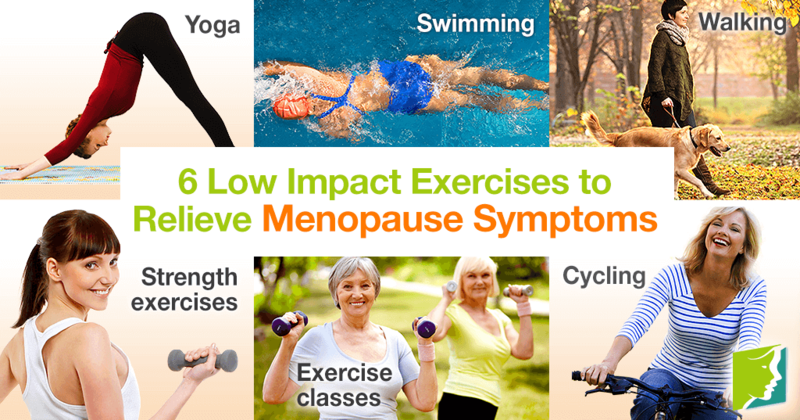 This article will highlight several low-impact exercises that can help relieve menopause symptoms. It is helpful to try out different exercises to see which ones you enjoy most and which work for your body. Exercising offers a multitude of health benefits - it improves cardiorespiratory function, deepens sleep, boosts mood, reduces pain, and lowers stress. Exercising also helps prevent osteoporosis and reduce the risk of high blood pressure, heart attacks, and strokes. The general recommendation is to get around 30 minutes of aerobic activity every day, three times a week. There are three elements of yoga: physical poses (called asanas), controlled breathing (practiced in combination with asanas), and short periods of deep relaxation and meditation. Yoga is a gentle exercise, and classes vary from beginner level to challenging and advanced. Studies have shown that yoga can reduce the impact of stress and anxiety and depression. Yoga also improves flexibility, balance, and muscle tone. Swimming is an excellent low-impact exercise that can help relieve menopause symptoms. Swimming is great for relieving joint pain, as moving in water doesn't put any pressure on the joints, but it still increases heart rate. Swimming is also an effective calorie burner and improves overall health and fitness. Walking is easy to do anywhere, and it offers many health benefits, like joint pain relief. You can easily incorporate more walking into your daily routine by replacing a short drive with walking, or getting off the bus or train one or two stops earlier than usual. Using light weights or resistance bands can help build muscle and protect against injury and osteoporosis. There are numerous exercise classes offered that can be a fun alternative to the gym. Dance classes, like Zumba, provide a good aerobic exercise while incorporating upbeat music and dance moves. Exercising regularly offers countless health benefits and can significantly reduce menopause symptoms, like fatigue and weight gain. Studies have shown that exercising can increase energy levels as much as 20%. These low-impact exercises featured in this article are inexpensive and can be fun to do with friends. With any exercise, it is important to start out slow and small and then build up in order to prevent injury. Read complete information on approaches for treating menopause symptoms. Women experiencing menopause or pregnancy often encounter similar symptoms. Click here to how to know which one is.